THE AUSTRALIAN BESTSELLER! Stephen's most personal book. 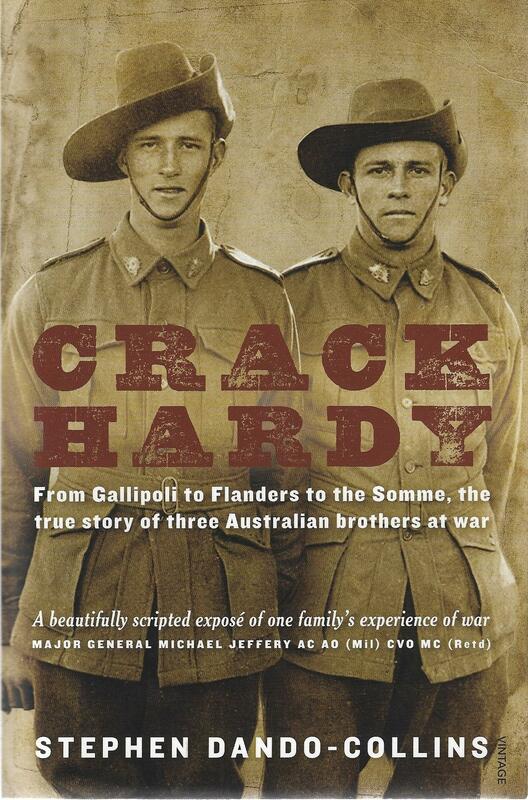 The true story of three Australian soldiers, the Searle brothers, Stephen's great-uncles. One brother was killed at Gallipoli, another on the Western Front. One came home a decorated hero. Viv, a gifted poet who was planning to be a clergyman before the war, became a deadly efficient sniper. Ray shot himself and was charged with desertion. Ned was a true Australian larrikin, up for anything, and the black sheep of the family. The Searle boys had to 'crack hardy', or grin and bear it, as they fought in one grueling campaign after another—from the first wave of the Gallipoli landings to Lone Pine, from Ypres to Messines and Hill 60 in Flanders, to bloody Somme battles at Mouquet Farm, Bullecourt, and Hamel, with their brothers and mates falling all around them. Back home in an Australian country town, their mother, father, sisters, and remaining brother also had to crack hardy, as the bad news from the front just kept coming, and coming. The Searle brothers' great-nephew, award-winning author Stephen Dando-Collins, uses the letters and journals of the Searle brothers and remembrances of other family members, to create a compelling book that defines Australia and Australians during the making of their young nation on the far-flung battlefields of World War I.